I was at the Knitting Stitching show when I saw the most gorgeous piece of dyed velvet, sort of burnt yellow going into rusty orange. I had to look at it for some time, to take the glorious colour in, thinking of the possibilities. It was on Stef Francis' stall, the Queen of dyeing. 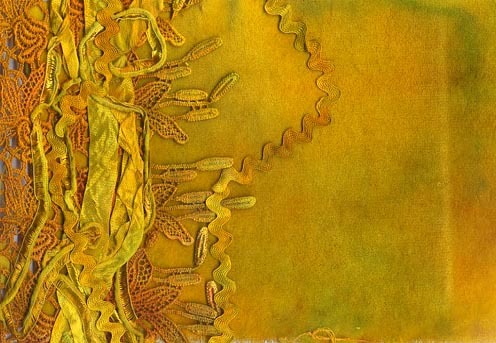 I know she has been dyeing from way back (when I used to belong to the Embroiders Guild in the 80's)and using her dyed textiles in her exciting embroideries. 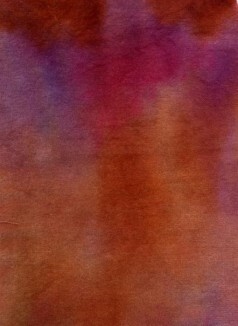 She mainly uses Procion Dyes to obtain the strong rich hues in her colours. I used to attend batik workshops and had a few nearly empty pots of Procion dyes left over which I now was eager to try and replicate this colour combination. What resulted was not really similar but to me equally beautiful. I had to get into dyeing further so I started to research. The information I found didn't seem to apply to my needs, I didn't want to dye in a gallon vat, nor tie dye for kids parties. My quest was for small amounts, painting on the dye using various colour combos, or dyeing some beautiful variegated ribbon for my future work, the techniques and recipes weren't suitable. Being used to mixing colour in my painting, I wanted more of a controlled painterly approach So I decided to experiment and find my own way. About Procion Fibre Reactive dyes. These dyes come in a powder form and are mixed with liquid chemical solution to fix and make washing and lightfast. Its not difficult once you have the recipe and know how long to developed the dye. They are used with natural fibres, Silk, Cotton,Wool, Wood and Viscose Rayon a man made cellulose fibre made from trees. They wont work with polyester, nylon, acetate etc the dye runs off, for these you can use fabric paints dyes such as Dye-na Flow, and Dylon. I needed the raw materials, mainly the dyes at a reasonable price, so after much searching and comparing in UK and US, Dharma Trading Company came out tops. In the UK you by 2/3 oz pot for �($10) approx, in the US at Dharma they sell a 2oz pot for $4 (� approx. So I did the maths. Plus the range of colours available is fabulous. I don't feel the need to pay more than necessary for materials wherever I can and even with the postage, buying 8 colours was a great saving. You may take some time in choosing your colours from their vast array. (Un fortunately Dharma don't sell to the UK so if you have a friend in the states, like I did you're in luck) Two other ingredients are necessary, these are urea and soda ash used for fixing the dye permanence. To buy these in the UK I found Candle Makers supplies opposite Olympia Exhibition Centre where they will also sell the Fibre reactive dyes. So having gathered your materials together. You need:- Procion Dyes, Urea, Soda Ash, Fabrics / ribbon/lace etc you want to dye. I don't like to waste anything. Usually most fibre reactive recipes result in throwing leftover dye away, as when the ingredients are mixed together they only last for 10 hours. Even though I mix up small amounts as needed I devised a different more economical procedure. You will find many other recipes, but, I made this in small amounts to avoid waste and is easy to do. Cut up the fabric amount you want. At first you may prefer to do some practise trials on small pieces, or go straight ahead with a piece big enough for a purse/book cover, pouch. Cover working area with protective plastic sheet. Soak the fabric in the soda ash solution, cotton velvet will soak up more than most fabrics, squeeze to get all over coverage, but it doesn't have to be sopping wet. Excess can be returned to the jar. Dip your brush and usually working from the lightest to darkest in the first colour paint on your fabric. Because it is already damp with the fix, the colour will spread reasonably easy. Apply the dye to wherever you want then take the second colour into other areas then build up with the third colour, overlapping to create secondary colours and tertiary (3 colours mixed together). So when you have your fabric piece dyed, cover with some plastic bag and if you have a radiator, you can put near it to help the dye develop or somewhere warm, but I've done it without and it was fine. Leave for 24 hours. Then rise in warm water. You will see some colour being rinsed out, but this is normal--dry and admire. You can iron smooth or try wrinkling up velvet for a crushed look. Put your ribbon in a ziplock bag big enough for plenty of room for expansion. Leave the opening partly open. Put in your microwave and blast on full power for 2 minutes stopping every now and then to allow the steam to die down so it doesn't burst ( now you really don't want this to happen so watch carefully ) Let cool down before opening. Then rinse under the tap and dry. You can now build up a gorgeous collection of your very own themed colour embellishments. Also look out for cotton or rayon ric rak, it looks lovely in a variegated colourway. If you do have any dyes leftover at the end of your session, you can put into small bottles/containers labelled for another day, or consider going a bit mad by sploshing it over paper, any will do, even recycled items such as envelopes, and newspapers, tags, photo copies, tissue, anything to hand. The colour can be used like an ink or watercolour paint and wont deteriorate and you will have some cool papers to use later. If you want to redye your fabric, you can resoak in the soda ash solution and repaint. Overdying existing suitable fabrics can completely change their appearence, and make them more interesting to use. Looking at the colour charts, you might be overwhelmed. But its always a good idea to get the basics first from which you can mix most hues. But colours can be funny there are warm yellows and cool yellows and depending on which you choose the result can be slightly muddier or clearer. With yellow, its also a good idea to get double the amount as this can get used up the fastest. So go for Brilliant yellow and Golden yellow. A Magenta red (often called Fuchsia )which has a blue tinge plus a Brilliant red which has a yellow tinge will give different purples, and a turquoise blue and a brilliant blue also mix differently. Brown is useful to tone down and make subtle hues, Black and I also loved the Burnt Orange, Hot Pink and Burgundy. 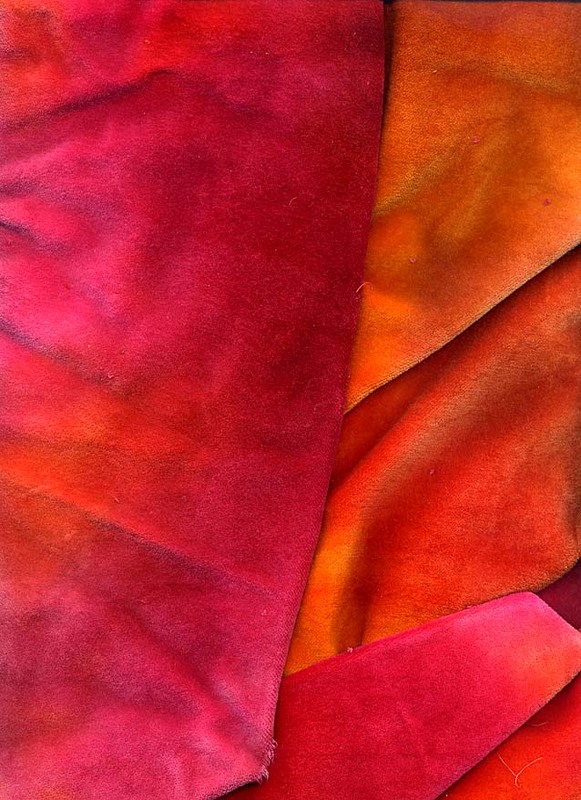 There are so many projects that your hand-dyed fabrics can be used with. 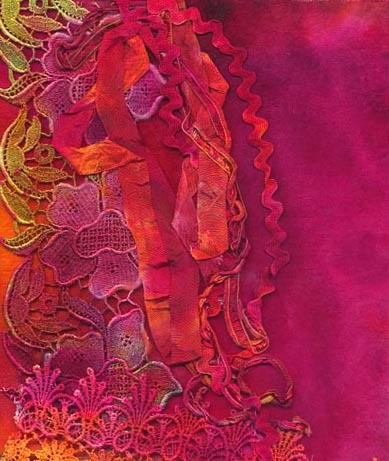 Collaged together with other dyed textures, velvet and satin, lace and ribbons. Contrasting the colours to make scintillating compositions or harmoniously blending them together, adding beads, charms buttons for definition and highlights. Machine stitching and or hand embroidery stitches, adding sheer organza or metallics with Wonder Under to give more surface interest. 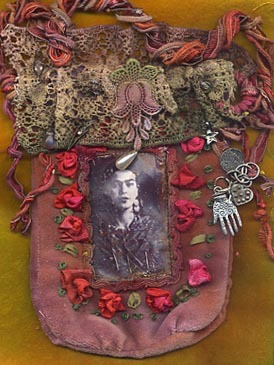 Purses pouches, journal covers, covered boxes, dolls and danglies spring to mind. Sells wide cotton velvet at a reasonable price.